Item descriptions: Feature: ?Speedcam/red light warning Speed detection & alert when exceeding speed limit; Speed detection & alert when exceeding speed limit. ?Voice guidance Voice turn by turn guidance, advance lane guidance. ?Multiple searching options By postcode, an address, part of an address, category, favorite destinations, or history. ?FM broadcast Broadcast voice turn by turn guidance, music and video from your GPS. Note: when the FM open, the speaker close. 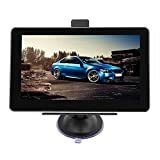 CPU:MediaTek MT3351 500 MHz RAM:128 MB SD RAM LCD Display:7" TFT LCD touch screen display, Resolution: 800RGB(H) x 480(V) Operation System:Win CE.Net 6.0 Core USB:USB Client 2.0, MINI USB port Expansion Memory:TF Card: Maximum 32GB (8GB Memory Built-in, TF Card is NOT included) Video Player:Entertainment Video Play MPEG-4, DivX, Xvid, MPEG-2, MPEG, AVI, DAT, MPG, MP4 etc Audio Player:WMA, MP3, WAV Photo Viewer:JPG, GIF, BMP, TIF E-Book Reader TXT:TXT Package included: ?1 x 7 Inch Car GPS Navigation ?1 x UK Charger ?1 x Car Charger ?1 x Car Suction Cup Mount ?1 x USB Cable ?1 x Back Splint ?1 x Touch Pen (at the left size of Monitor) ?1 x User Manual Precaution Please unplug your car charger and GPS navigator when your car engine is started in order to avoid any damages.